Each of my three children has their own photo albums that I have crafted for them over the years. In order to make these personalized keepsakes, I’ve adopted a simple photo organizing process. After taking photos with my smartphone, I always try to find some quiet time to delete the ones I dislike. About once a month, I then upload the “keepers” to my computer, edit them as needed and assign the photos to their appropriate folders, such as “2016 PHOTOS.” At the end of the year, I download my favorite photos onto a flash drive and take them to a photo processing center. Next, I place the hard-copy photos into each child’s temporary photo bin. Once sorted, I choose individual photo albums and begin filling them with memories. My oldest has about eight photo albums now and my youngest has about four. They will eventually take the albums with them to enjoy as adults. Although this photo organizing system works for me now, I honestly don’t wish to continue making albums for my children as they enter adulthood or for the next generation. With the recent birth of my granddaughter, I have implemented a simpler system. Now, I upload photos from my smartphone to an online photo service, such as Snapfish, and create photo albums from there. It’s much easier to create an online album if my photos are already streamlined and sorted. For example, in my granddaughter’s album, her pictures are assigned to a folder with her name and date. With today’s technology, creating beautiful keepsake albums is faster and easier than ever. It’s even possible to create albums directly from your smart phone with an app from Target. If you find that you have a large assortment of photo prints, you can sort the photos using acid free photo boxes, or you can use shoe boxes, temporarily. For a recent client, we labeled her shoe boxes as “Travel,” “Nature,” and the names of her children. In her case, she decided to pass the photo boxes on to her children and skip the albums altogether. Other clients prefer to scan the photos, save them virtually and eventually create albums from their computers. 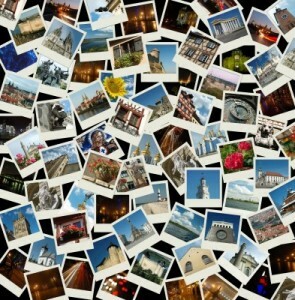 Photo organizing can be overwhelming when you have hundreds of photos stored all over the house. When working with my clients, I’ve found that once they get started, the memories come back, they start smiling, and a sense of peace comes over them. They know that their most treasured memories are safe and can be enjoyed by generations to come. It contains the “film” on which your lifestyle is imprinted. Design your environment to align with your goals and inspirations. Keep only the treasures and let go of what you don’t use or love. Develop systems and habits to keep up with daily goals. And if things don’t work out, take another shot. Backsliding happens…just restart using those systems and habits! • Carve out time to go through your items and let go of the excess. • Put similar items together where they are used when arranging what you keep. • Develop systems to process mail, clean up, and manage your tasks. 7 Steps Organize Your Digital Photos! With the holidays and photo taking season coming up, it’s not too early to start taking some steps toward organization. This will make it easier to retrieve photos, create cards and books (think gifts). Because organizing the past can be overwhelming some people choose to start with the current. My personal choice is to do the old ones as well. Decide whether you want to go back and clean up all of your old photos OR do you want to start from now. Download photos from your phone, camera and tablet frequently. If you lose your phone- your photos could be gone forever. There are many software programs, some are great for sharing, some are great for printing cards, invitations and pretty much whatever you want, others not so much. Choose a program that meets your needs. Some of the more popular ones are: Linea, Shutterfly, Picasa, Flickr, and there are many more available your computer/laptop may already have software on it. If you are a Mac user iPhoto is good for organization. When you are looking through your photos delete what you can, they take up a lot of space and we don’t want to use up space for bad photos. Create folders or albums, this can be done either before or after you download. Some programs will allow you to tag your photos and rate them. That will help you sort them more easily if you are searching for something. This may not be necessary but it is available in some programs. Now you are ready! You can easily create and print your cards, photo books photos on canvas and the myriad of other products available. The final step is to BACK UP, BACK UP, BACK UP. Looking to hire an organizer? Need help making decisions on the many items cluttering up your beautiful home? Why not start with NAPO-GPC? What? You’re not really sure what that is? It’s the National Association of Professional Organizers Greater Philadelphia Chapter: whew — that’s a mouthful. We are eighty members strong. Plus associate members which include Philly Junk and Impact Thrift Stores. The chapter started in 1996 and has grown by leaps and bounds. Once a month we meet for networking, professional development workshops, and educational programs. Workshop topics include ADD, Feng Shui, chronically disorganized, and senior relocations. Our library has close to one thousand resources for the members to rent including books, CD’s, and videos. Did you get to meet us at the Philly Home Show? Perhaps you saw us on the NBC 10! Show or called WHYY and spoke to us on the phone when you gave your donation. You probably heard about Project Thanks, where we organized the home of a veteran after she completed three tours in Afghanistan. We also plan shredding events and collected thousands of shoes for Soles4Souls. This winter we are planning on helping Cradles to Crayons. Our members are amazing! Some are strictly residential organizers, some corporate, others specialize in home staging, home design, working with clients who have disabilities, and collections including photos and antiques. Coaching is part of the organizing process too, including holistic life coaches, business coaches, academic coaches, as well as consultants. Check out our website at NAPO-GPC.org. There you will find even more information about our wonderful association as well as our blog with many tips and hints to help you get started on your organizing projects. When you are ready to hire an expert click on “Find an Organizer”, you will be glad you did!